Note: Shuttle buses between Minhang Campus and Xiangtaiyuan-the Station of Dongchuan Road on Metro Line 5 (Shiping Road) and the Shendu Highway Station of Metro Line 8 are out of service on weekends, holidays, and summer & winter vacations. 1. Bus: No. 765, 67, 829, 69, 754, 856, 524, 224, 909. 2. Subway Line 3 & 4 & 13: get off at Jinshajiang Rd. Station, ten minutes’ walk to ECNU. 3. 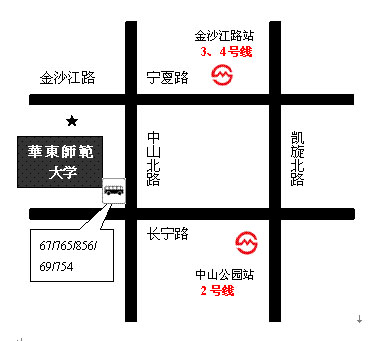 Subway Line 2: get off at Zhongshan Park Station, take Bus No.765 or 67 to ECNU. Add: No. 500 Dongchuan Rd. 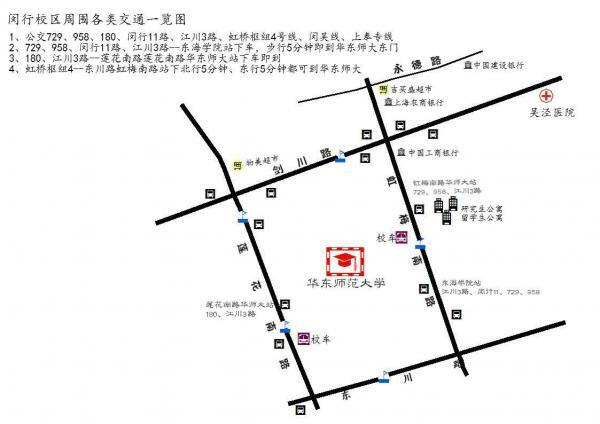 Take Subway Line 3 or 4 to Jinshajiang Rd Station, ten minutes’ walk to ECNU. a. Subway Line 2 to Zhongshan Park and then take No.67 or 765 bus to ECNU. b. About ￥50 for the 30 minutes’ taxi drive from the airport to ECNU. a. No. 6 airport shuttle bus or Subway Line 2 to Zhongshan Park, and then take No.67 or 765 bus (get off at the stop East China Normal University) to ECNU. b. About ￥200 for the 90 minutes’ taxi drive from the airport to ECNU. You may show this address to the taxi drivers: 中山北路3663号华东师范大学.